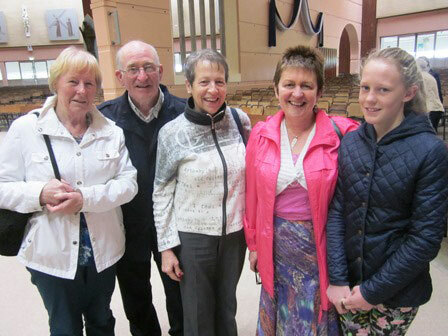 We are happy to publish more photos from the 2013 Annual SMA / OLA Pilgrimage to Knock which took place on Saturday, 25 May 2013. On left are some pilgrims from Toomebridge and Randalstown, who have come faithfully every year by bus, for nearly 20 years. Despite an overcast day, with some light rain in the afternoon, it was a great opportunity for our supporters to gather with us, OLA Sisters and SMA priests and brothers, to pray for particular intentions of the Novena. The Rosary procession was able to take place before the rain began to fall. It was as one lady put it, “a soft rain” to keep us cool! Our pilgrimage was also an opportunity for us to meet up with some of our supporters and to thank them personally for their prayers and support down the years. An important part of our Pilgrimage is the celebration of the Sacrament of Anointing, praying God’s healing touch on those pilgrims who are in particular need of this sacrament at this time. After the prayers of invocation etc the priests moved through the congregation anointing those who sought the sacrament. 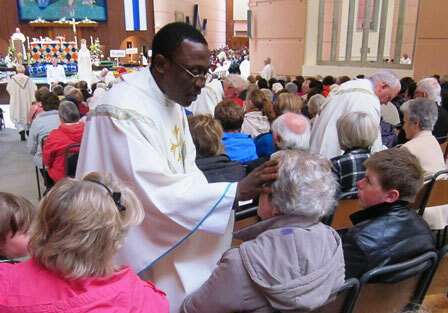 Fr Reginald Nwachukwu SMA (from Nigeria) and Bishop Kieran O’Reilly SMA of Killaloe anoint some of the pilgrims. Bishop O’Reilly also preached the homily. Read it here. When all those who sought the sacrament had been anointed the Mass continued with the Prayers of the Faithful which were led by representatives of the different FVC areas in Ireland. 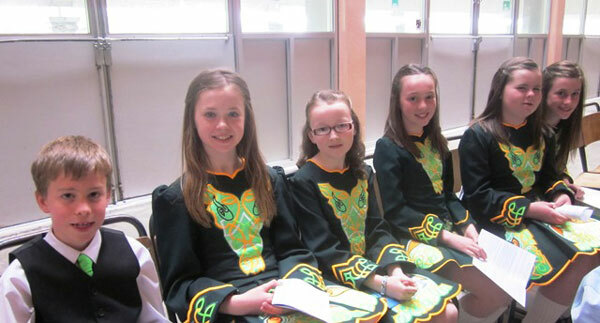 The Offertory Procession was enlivened by the beautiful music and dancing of the Mary Baxter School of Irish Dancing from Omagh, Co Tyrone. The young girls and boys danced in groups and the gifts for the Mass – bread and wine – were carried by some of them to the Altar while eight of the boys danced in praise of God. It was a moment much appreciated, and remarked on positively later, by the entire congregation. Our photo below shows one of the groups from the School who participated in the celebration. The various parts of the Mass – Alleluia, Sanctus, Lamb of God – as well as the different hymns were sung by the multicultural choir under the guidance of Sr Marie Dunne. OLA Sisters Eileen Cummins and Martha Ahern were among the pilgrims. Brian Devenney (from Castlederg, Co Tyrone) and Bridget McAleer (Sion Mills, Co Tyrone) have been Head Sponsors for too many years to mention…. Many thanks for your continued support. The Irish branch of the SMA was founded in Cork so it was to be expected that many of our pilgrims would come from the Rebel County! 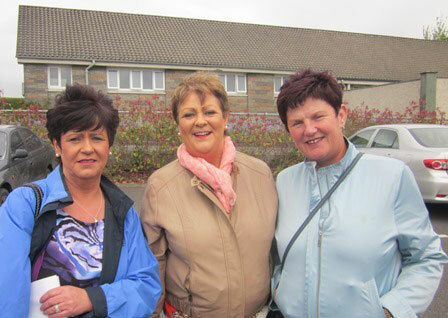 Mrs Judy O’Leary (on left) came from Cork City with her two sisters, Frances and Nuala. 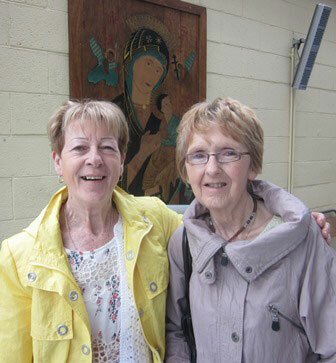 We also met Marion O’Mahony with her friend, Marie Tobin, all five of them coming on the buses organised from the SMA parish in Blackrock Road, Cork. Other pilgrims used the SMA Wilton bus and buses from other parts of the county. 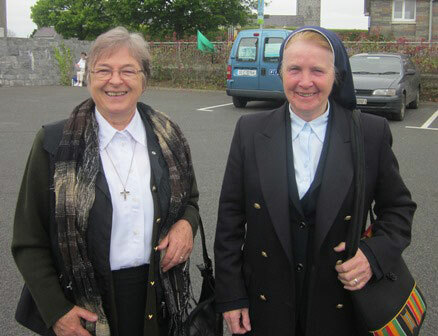 Some of the OLA Sisters and SMA priests accompanied the pilgrims on several of the buses, coming from Cork and Dromantine particularly. 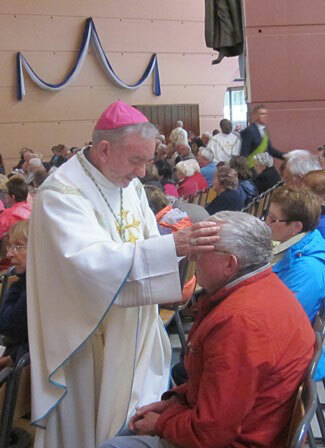 As has been the tradition for Dromantine pilgrims, the Vigil Mass for Sunday was celebrated in Dromantine upon their return, about 11.15pm, followed by some tea and sandwiches, before the weary pilgrims got in their cars to drive the final lap to their homes all over counties Down and Armagh. 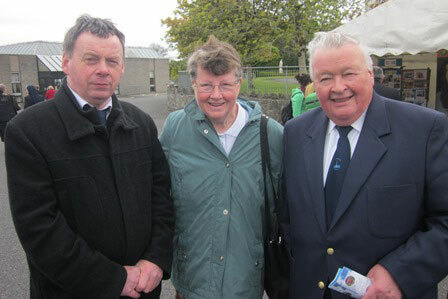 Many of the pilgrims asked after Fr Fachtna O’Driscoll SMA who has led our pilgrimage for the last eleven years and who would have led this one had he not been elected to the Office of SMA Superior General last month. Fr Fachtna is now based at our Generalate in Rome. He and the new SMA General Council were prayed for during the Mass. In his closing remarks at the Mass, Fr Dunne thanked Fr Gibbons and all the staff at Knock Shrine for their warm and ever-courteous welcome. We look forward to the 34th SMA Pilgrimage in 2014. For other photos and report click here.